Gov. 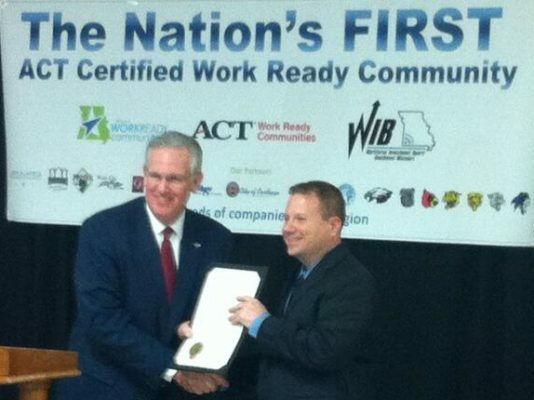 Nixon headlined a press conference in Joplin Friday announcing that Jasper County earned the Certified Work Ready Community designation through ACT and the Missouri Department of Economic Development. Thousands of individuals that earned the National Career Readiness Certificate (NCRC) helped Jasper County reach this prestigious goal. Held at Franklin Technology Center, the press conference showcased the partnerships with businesses, education, economic, and workforce development. Jasper also ranked as the first county in the nation participating in the national ACT Certified Work Ready Communities (CWRC) initiative to meet 100 percent of ACT’s criteria goals. Jasen Jones, executive director at the Southwest Missouri Workforce Investment Board (WIB) which serves Jasper and six additional counties, credits the accomplishment to the robust relationship that links Jasper County educators, chambers of commerce, nonprofit organizations and employers. “This Work Ready designation can truly help a community transform its economy and gain a competitive advantage in expanding existing businesses and attracting new businesses and jobs,” says Jones. He envisions establishing Work Ready Corridors along Interstate 44 and 49 involving a broad swath of southwest Missouri and extending into neighboring states where the NCRC is also recognized and valued. More than 3,000 Jasper County individuals have earned the NCRC at the Bronze, Silver, Gold or Platinum levels since 2006, with more than 1,000 of those earned since January 2012. More about Jasper County’s CWRC initiative and efforts underway across Southwest Missouri can be found online. The initiative is a national effort, led by ACT, to provide a framework for states to strengthen economic development using a community-based approach grounded in certifying counties as “work ready.” States award this certification when counties achieve established goals of individuals in the workforce earning the ACT National Career Readiness Certificate (NCRC™) and businesses recognizing, preferring, or recommending the NCRC. States may add additional criteria to their unique initiatives. A voluntary effort to align workforce and education to meet the economic needs of the state and local communities, the ACT Certified Work Ready Communities initiative began in January 2012 with Missouri, Oregon and South Carolina participating. Utah, Wyoming and the Dan River Region Collaborative in Virginia joined the movement in July 2012, and additional states will be named soon. The common certification criteria, community goals and monthly workforce skill data are available online at www.workreadycommunities.org.